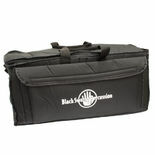 Travel In Style.....with the Black Swamp GB24 Gear Bag. 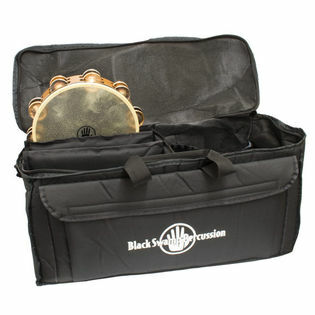 This bag is a welcome solution for percussionists on the go who want to keep their instruments organized and protected. Designed by working percussionists to carry all your gig essentials. Padded, heavy duty Cordura construction with shoulder strap and carry handles Overall size 24 long, 10 wide, 12 deep Large front pocket for bass drum beaters, chime mallets, tam-tam beaters, or snare drum stand. On one side, a removable padded divider creates three compartments. Each compartment can fit a 10 tambourine, woodblocks, or similarly sized instruments. The divider is attached with velcro, so you can quickly and easily remove it to access the entire length of he bag.The other half is an open area with two side wall pockets. The open area fits castanet machines, cowbells, wood blocks, shakers, etc. The side wall pockets will store your castanets, triangles, triangle beaters,metronomes, or other small accessories. This came highly recommended by band director for grandchild in first year of college with double music major. We needed something to help transport our small percussion instruments to another venue. Easy to use, and just the right size to put all that we need to do a concert. FYI, it is a soft shell case. This bag is a great idea... Problem is, it's made very cheaply! The bag looks to be rigid from the pictures, let me assure you, it is not rigid, it's little more than a soft duffle bag. The bottom of the bag is rigid, but it's just cheap cardboard that will deteriorate with regular use. The material used to make the bag is also cheap feeling nylon. The pockets are a good idea, but when you put items in the pockets they just sag. Good idea terrible execution.